The speculation that Lucas Torreira will be joining Arsenal or not might certainly be over as his father has confirmed he is set for medical in London. 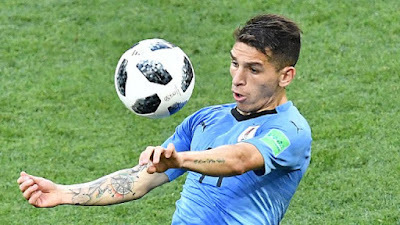 Torreira has been a key figure in the Uruguay squad since the beginging of the World and and Arsenal are set to sign him. Report also has it that Arsenal has agreed on a £26million transfer fee with Sampdoria. Lucas Torreira will be in action again when Uruguay takes on France in the quater-final game on Friday.